In Sarva-darsana-sangraha the author successively passes in review the sixteen philosophical systems current in India in 14th century CE, and gives what appeared to him to be their most important tenets, and the principal arguments by which their followers endeavoured to maintain them. In the course of his sketches, he frequently explains at some length obscure details in the different systems. The systems are arranged from the Advaita-point of view. They form a gradually ascending scale-the first, the Charvaka and Buddha, being the lowest as the farthest removed from Advaita, and the last, Sankhya and Yoga being the highest as approaching most nearly to it. The author, Madhavacharya or Madhava Vidyaranya (not to be confused with Madhvacharya, propounder of Dwaita philosophy) was an exponent of the Advaita school of philosophy in Hinduism. He is said to be the brother of Sayanacharya who wrote a commentary on the four Vedas. The present translation was originally published serially in the Banaras Pandit between 1874 and 1878 and was carefully revised and republished in book form later and a second edition was printed in 1894. Aap ne sanatan dhama ka upkar kiya . Bhagvan sri Chandramaooliswar aap ko mukti pradan kare prarthana karata hun . Branch -Sri kanchi kamkoti pttam . I will try to help you, if you provide a list of works of Vidyaranya Yati. I am an advocate and law book author for AIR Nagpur. Presently I am engaged in writing a book in which I wish to project and popularise ‘Mimamsa’ rules of interpretation in the modern Indian legal system. I have seen “Shree jaimini Praneete Mimamsa Darshane” in the Asiatic Society, Mumbai. It is a comprehensive work and I would like to have a copy for my reference and research. It would help me enormously if a Hindi or English translation is available. can you please help me? I am willing to come down to Pune for this. Dr Verma, You can download Jaiminisutra with English Translation from the following link. 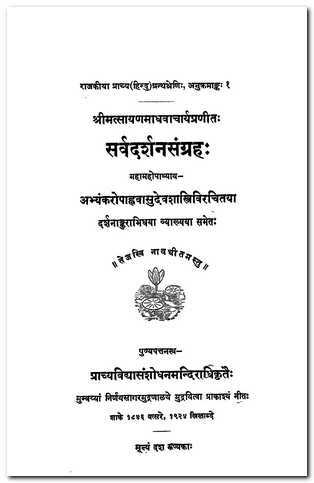 It was published in 1923 from Allahabada as part of a reputed series “Sacred Books of the Hindus”. very nice service is offered by your grace. many a thank by heart. I want sarvadarshanasangraha text with english translation. Himadri, Giving below link to Sarvadarsanasangraha with English translation. Is there a translation of sarva darshna saMgraha to Kannada or Hindi or English (in that order of priority) by an Indian scholar rooted in veda vaNgmaya ? Giving below links to Sarvadarsanasamgraha with Hindi translation by Govinda Suri & Umashankar Sharma. sarvadarshan samgraha in bengali.please give me a link..